As an occupational therapist at HBH Senior Living, Carol Turner has been very involved in the implementation of the Eden Alternative at HBH Senior Living. She’s seen the difference it makes to the lives of residents – and to the daily routine of the staff. Principle 5 of the Eden Alternative aims to overcome the three major problems of residential care – loneliness, helplessness and boredom – by imbuing life with variety and spontaneity, and allowing for the unexpected and unpredictable to take place. To achieve that, staff members have to be more flexible and spontaneous in their approach too. 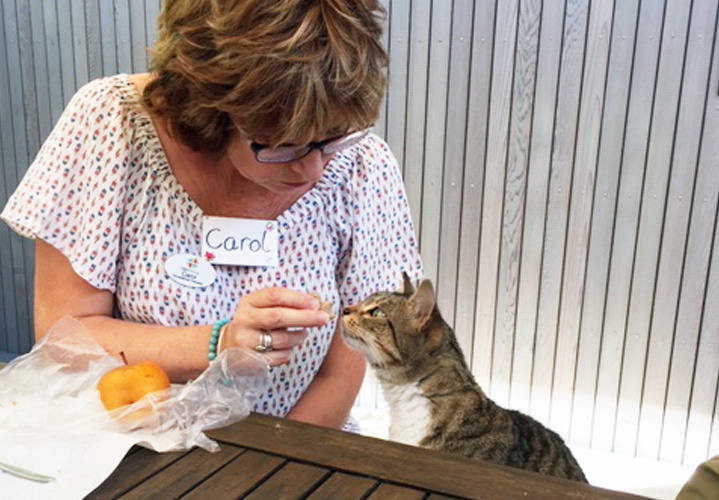 During the day, residents are encouraged to help with things like helping to deliver morning tea, wiping trays, folding napkins, cleaning out the budgie cage – all things which allow them to contribute to daily life. These day-to-day tasks not only provide more variety, but also help residents and staff to connect with each other. “Eden has been a big change and fostering variety and spontaneity does require a certain amount of courage! Your day looks quite different – less task driven and more focused on supporting residents to engage with the daily running of their Community,” explains Carol. Carol says they still provide a general framework for each of the communities to run with – for example, each week has a theme and residents have input to these. Saint Patrick’s Day was a theme in February, but the occasion lasted for a week instead of the usual day!